Taylor Kitsch is still somewhat of a unknown only having his big screen breakout in this summer film X-Men Origins: Wolverine, but just recently wrapped shooting the lead role in a "The Bang Bang Club" directed by Steven Silver. Kitsch also had a lead role on the somewhat television hit "Friday Night Lights." Kitsch who isn't extremely ripped is not the first actor that comes to mind when I think of Carter, but should definately fill the role out nicely. The question is, if he will be a reason for people to go see the Disney adaptation? I doubt it! John Carter in the story, is a damaged Civil War veteran who finds himself mysteriously transported to Mars, where his involvements with warring races of the dying planet lead him to rediscover his humanity. 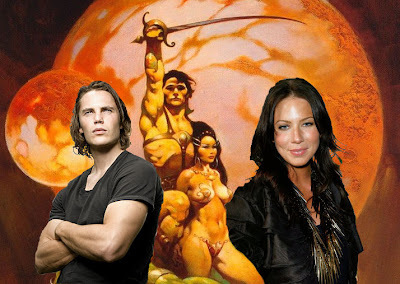 Lynn Collins will play the Princess of Mars Dejah Thoris and the love interest to John Carter. Her character is a strong willed woman who is ultimately always faced with mortal danger and a centeral figure to the John Carter of Mars stories.